Fans of the Die Hard franchise will be very happy to see Bruce Willis back for another turn as John McClane in A Good Day to Die Hard. 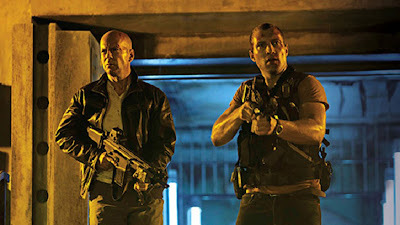 Meanwhile, director John Moore is most likely hoping the iconic action hero can keep his latest effort from being as much of a total disaster as his last movie (2008's Max Payne) was. This time around John McClane is off to Russia to see what's going on with his son Jack (Jai Courtney) who apparently has run into some major trouble and its up to good old dad to try and figure out what's going on. 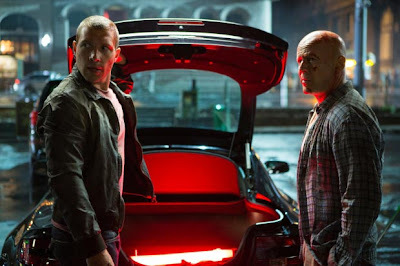 Of course, in any Die Hard movie, things are never quite what they seem to be and, when father and son are finally reunited, a blown CIA operation turns in to something much more explosive and the dysfunctional duo find themselves right in the middle of it all. 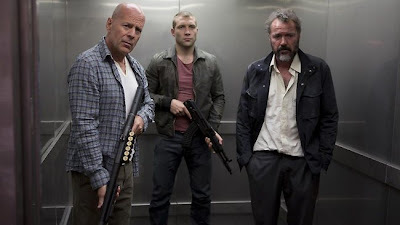 Once upon a time, the Die Hard franchise made its mark by showing how an ordinary guy, like Police officer John McClane, could seemingly pull off the impossible by defeating bad guys who should have been more than a match for one single officer of the law. 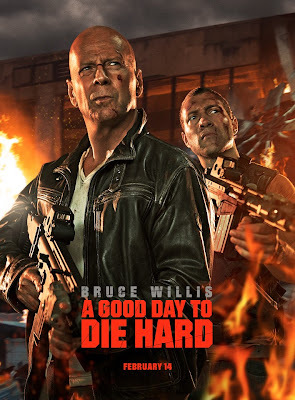 Somewhere along the way, that winning formula was replaced by CGI explosions and overblown stunts to the point where they really shouldn't even be called Die Hard movies any more. If you look at each of the first four pictures I've put in this review, as well as the movie poster, you will see how they are all pretty much the same shot of the two McClane's. I did that intentionally to mirror the amount of effort, or lack thereof that went in to making this movie. Moore basically takes the audience through one action set piece after another with minimal dialog and no acting of any type to be seen anywhere. I chose the last picture to represent the gratuitous nature of the movie as the focus is really on eye popping visuals from the opening sequence to when the credits finally begin to roll. Sure, there are moments where a fiery explosion or a chase sequence that ends with more smashed vehicles than a demolition derby will have you gasping with excitement, but there are many more scenes where you're going to be cringing and groaning from the absurdity of it all. 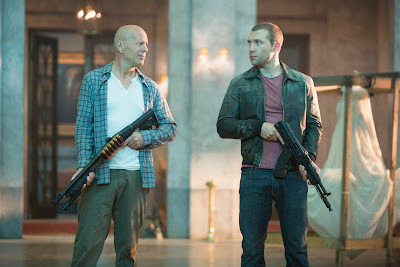 I really felt like the creators couldn't come up with a good enough idea on their own so they took some rejected CIA thriller and dropped McClane in to the middle of it. Fortunately the run time is relatively short at 97 minutes which keeps a lot of the exposition and filler to a minimum. What you end up with is a series of halfway decent action sequences thrown together with a plot that ends up not making any sense at all. That being said, its still good to see our old friend John McClane doing his thing although unfortunately A Good Day to Die Hard just doesn't measure up to what makes these movies so much fun to watch. Good write up! I may pass on seeing this one in the movies though. I think I'll wait for the blu ray. It sounds like it's a caricature of earlier Die Hard movies. Thanks for the review! Good review Marc. There is nothing of any value here to be found other than brainless bunch of fun, but that’s even giving it a bit too much credit.